Peekaroo Vest Discounts Apply ! 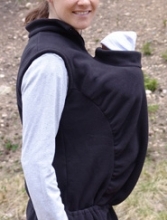 The Peekaroo Vest fits over any baby sling or wrap to provide the extra warmth you and baby needs. Add your coat and you're ready for winter. A light jacket or sweater, and you're ready for spring or fall outings. A light shirt or jacket, and you're ready for cooler summer evenings. Whether it's a crisp fall evening walk, a winter carnival, a springtime parade, or camping by the lake, the Peekaroo will keep your baby toasty warm without the usual bulk and clutter. Currently available in black, only. Essentials pocket for easy access to keys and cell phone. Can be worn for front and back carry. Perfect for Moms and Dads (and other care givers). Anti-pill, easy wash, Malden Mills fleece. Zippered neck, zip it up when you're cool, zip it down when you're warm. Pull the drawstring to keep little feet warm.